On April 26, 2017, I had the opportunity to fly on a training sortie during the U.S. Air Force’s Atlantic Trident 17 exercise at Joint Base Langley Eustis in Virginia. The war game brings together the three premier NATO air forces and the best operational fighters in the alliance’s arsenal including the Lockheed Martin F-22 Raptor—flown by hosts, the 1st Fighter Wing—the Lockheed Martin F-35A Joint Strike Fighter, the British Royal Air Force’s Eurofighter Typhoons and the French Armée de l’Air’s Dassault Rafales. 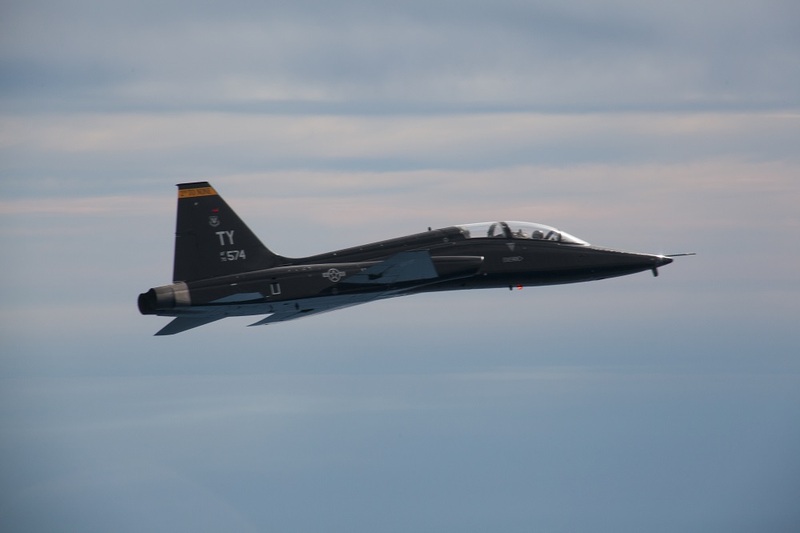 U.S. Air Force Boeing F-15E Strike Eagles from the 391st Fighter Squadron and Northrop Grumman T-38 Talon jet trainers from the 1st Fighter Wing’s own 71st Fighter Training Squadron provided “Red Air” support playing the bad guys. The first order of business was a stop at the Langley Air Force Base hospital to get my temporary 72-hour flight physical. The medical examination was very similar to a Navy Class I flight physical—which I have undergone several times—but without an audiogram or cardiogram. The Air Force flight surgeon told me that the examination was indeed an abbreviated and modified version of the Class I flight physical that is required for the service’s pilots. Because my sortie was what the Air Force calls a “familiarization flight”—which is usually afforded to Air Force pilots, officers and other personnel who normally carry out other duties rather than a typical media flight—I had to undergo survival training to fly onboard the T-38A that is identical to what the pilots receive. The training included instruction on water survival, on all of the survival equipment—including the various radios—and how to properly don the T-38A’s rather unique, old school flight-gear. Special emphasis was placed on how to harness into the parachute and ejection seat. Scheduled to fly with us was our flight lead “Score”—a veteran F-16 pilot—and my old friend “Fangs”—who I first met over a decade ago at Nellis AFB, Nevada, when he was an operational test pilot putting the F-22 through its paces. Learning from veterans like Score and Fangs, Tsar will have an enormous advantage when he begins learning to fly the Raptor on his next assignment. After we kitted up and “stepped” to the jets and strapped into the aircraft, Tsar quickly ran through the checklists and started up the aircraft. Once the jets were up and running, we taxied to the active runway for a formation takeoff. Entering into the fight, our three Talon/Fulcrums maneuvered around trying to engage the Blue Force aircraft. While the Talon doesn’t have the avionics or the kinematic performance to truly mimic a real Russian fourth-generation fighter—especially for a within visual range fight—the aircraft offers a reasonable facsimile of fighter performance at beyond visual range distances. Indeed, that’s the idea behind the T-38 aggressors—the job is to provide the F-22s with thinking targets that can ruthlessly exploit any weakness in tactics or pilot errors at long range using their intimate knowledge of the Raptor and its operations. If the Talons reach visual range—or encounter the Raptors at the “merge”—something has gone terribly wrong. 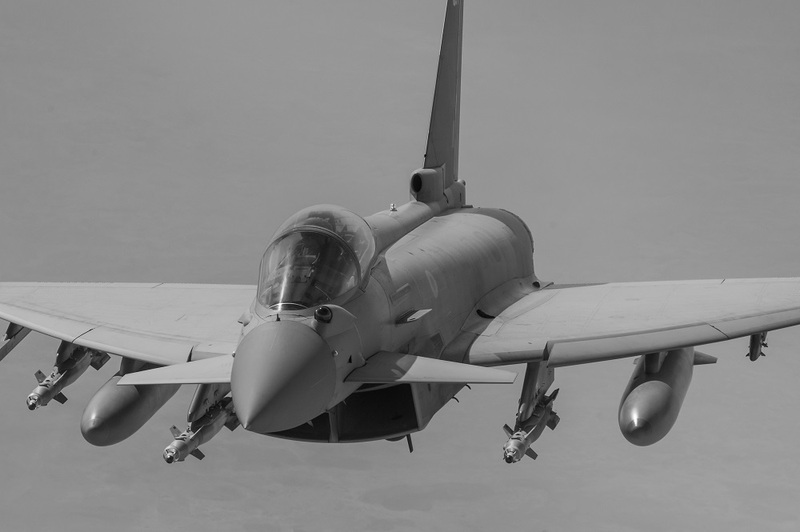 Even the British pilots flying the Typhoon agreed that the Talon provides a good threat presentation. As Tsar started to maneuver our aircraft, trying to evade an enemy we couldn’t see, a Typhoon coordinating with an F-22 quickly and unceremoniously dispatched us. 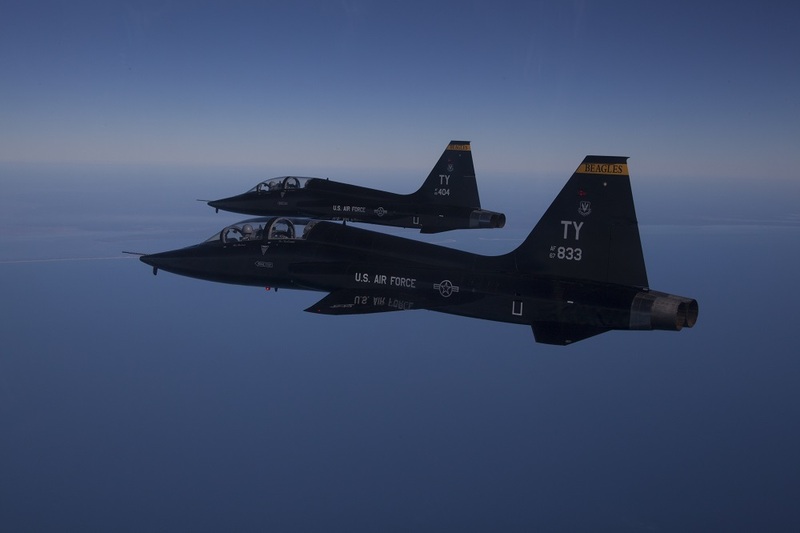 Unfortunately, the weather was terrible and we were ordered to return to base because of the need to maintain high fuel reserves—but normally the T-38s “regenerate” or come back to life several times during a sortie. But the bottom line is: Seeing is believing—the Raptor and Typhoon are a lethal combination. While the Raptor would be the most formidable fighter in the world due to its raw performance even without stealth, it’s now clear to me that even the F-35 with its mediocre kinematic performance will be an extremely dangerous foe in the air due to its low radar cross-section and sensors.